Calophyllum walkeri in a dieback patch at 2,100 meters near the eastern entrance to Horton Plains. Far from the beaches and ancient ruins is a Sri Lanka quite like no other. The patanas (grasslands) and cloud forests of Horton Plains offer visitors a sense of a primeval windswept, and temperate landscape in the middle of this very tropical island. Many who visit are surprised by what they find and yet for anyone familiar with the hill ranges of southern India there is a natural sense of déjà vu. Horton Plains is dominated by a plateau of rolling hills of patanas enclosed by the stunted cloud forests that are unique to the high Central Highlands. On the southern boundary the hills fall away in a steep escarpment. As I found on a recent trip, the coastline and Indian Ocean are clearly visible form the lofty escarpment edge. In the west the range extend towards Sri Pada (Adam’s Peak) through a ridgeline of protected forest now surrounded by tea estates. To the north, Horton Plains drops down slightly and is then connected to Pidurutalagala (Sri Lanka’s highest mountain at 2,524 meters) through the Nuwara Eliya plateau. 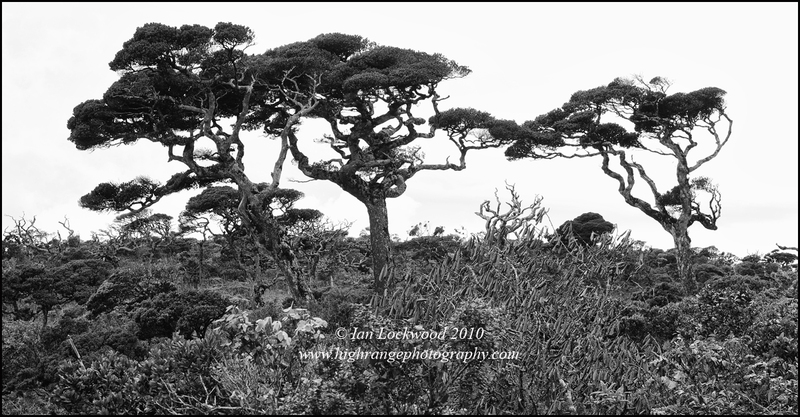 I have an emotional connection to Horton Plains that reminds me of the high altitude hills that I know well from my years in southern India. There on the high altitude plateaus of the Western Ghats shola/grasslands systems were once the dominant vegetation type. Both areas- the Central Highlands of Sri Lanka and the Western Ghats of southern India- have experienced dramatic change as plantation agriculture, hydroelectric schemes and hill station development have altered landscapes in the last 100 or so years. The loss of biodiversity is hard to fathom and remains an alarming issue as further areas are put under pressure of development. Horton Plains, like its counterparts in the High Range, Anaimalai, Palani and Nilgiri Hills retains a semblance of a forgotten past. The Central Highlands share a similar geological origin with the Western Ghats and the similarities in the landscape are unmistakable. It’s a theme that I have enjoyed exploring over the past few years (see my 2006 Serendib article for a more detailed description). Eravikulam, of course, has some of the best-preserved examples of the shola/grasslands system. Sri Lanka’s systems are wetter and have unique floristic characteristics that distinguish them. I recently had a chance to visit the Plains and came away with some positive experiences and images despite the large numbers of tourists that are visiting on a daily basis. The park is clean enough that crows are rare (a few years ago they were the most common species seen). The management by the Department of Wildlife Conservation is clearly being quite effective. 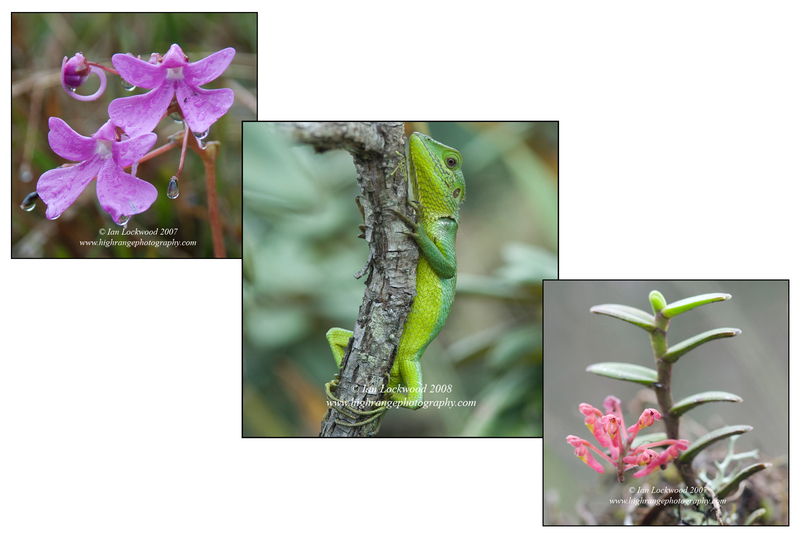 Species in the grasslands (patanas) and cloud forests. Impatiens. Sp., Calotes nigrilabris and a Robiquetia sp. orchid. Looking south east towards Kataragama, Hambantota and the Indian Ocean from the eastern entrance to Horton Plains National Park. It was clear enough that we could make out container ships on the ocean from this vantage point! 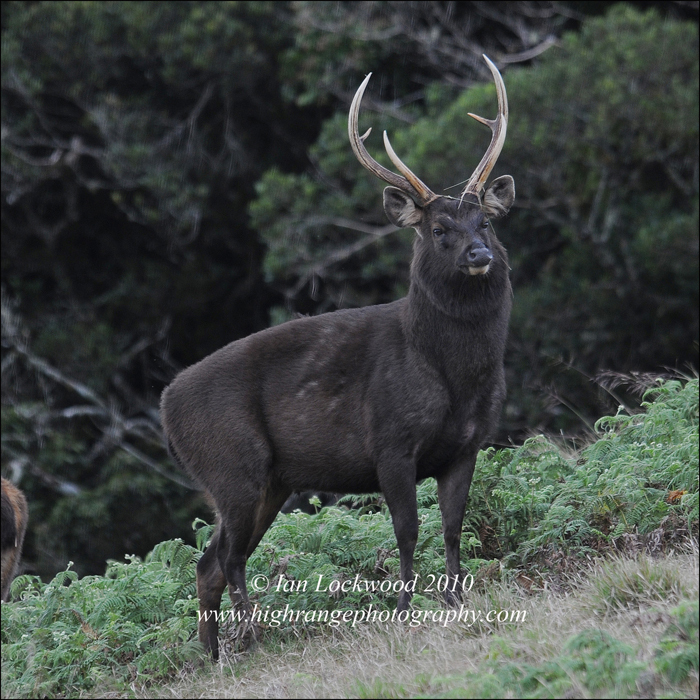 Sambar stag (Cervus unicolor) at Horton Plains. A common sight in the early morning before large numbers of visitors descend on the Farr Inn area. Shades of Eravikulam in Sri Lanka… patanas (grasslands) surrounded by cloud forests on the World’s End and Baker’s Falls trail. Note that cloud forest is growing on the ridge lines contrasting sharply with the high altitude shola/grasslands systems in the Western Ghats where sholas are in the valleys and the grasslands dominate ridge lines. 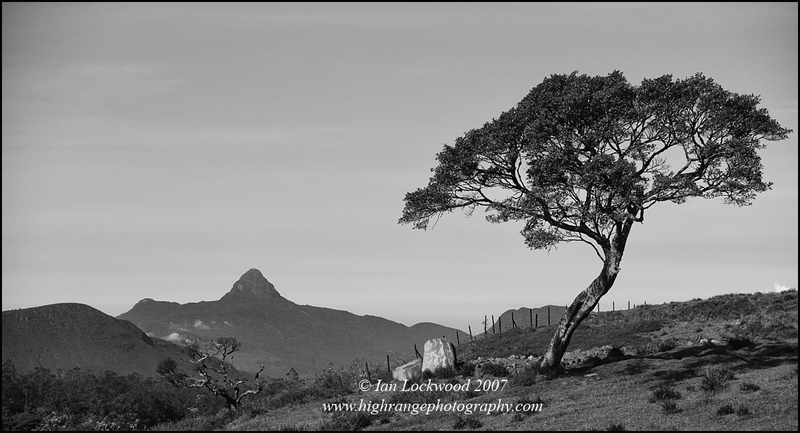 Sri Pada’s distinct profile seen from the Ambawella farms area under the shade of a remnant cloud forest survivor on the drive up to Horton Plains from Nuwara Eliya.